Beervana: Wait, There's Corn Sugar in My IPA?? No mention of the corn sugar, huh? Hmmm. I don't have an objection to this post or to the use of dextrose. I just think it's important for people to understand how dextrose is being used in their fancy IPAs. I've discussed it with Jeff. I'm baiting him to write about it. Well, consider me baited, Pete. It turns out using sugar is a somewhat under-discussed widespread practice, so let's discuss it. I think we should begin with the obvious question: who cares? The reason Pete even brought it up is because the use of sugar in beer was originally and ignorantly tarnished by craft brewers who considered its use purely a way to save money, with the added bonus of making the beer taste cheap and thin. In fact, sugar is a big part of the brewing traditions in Belgium and Britain, and it's used to enhance those beers. It does a few things. Because sugar is easily digestible by yeast, it thins a beer and adds crispness. This is a huge benefit in stronger Belgian ales. If you brew an all-barley beer to eight or ten percent strength, it will be both heavy and sweet. There are just too many unfermentable sugars in barley to get really attenuated beer. Let's take Duvel at not-quite random. It's a burly 8.5% beer, but it is incredibly lithe and drinkable. In fact, the name is a reference to that ease of drinking; like a Devil, it coaxes you into over-indulgence. Brewers at Duvel do a multi-step mash to get the most fermentable wort possible, but they also add sugar, perhaps 15%, and this pushes the beer to a finishing gravity of 1.5 Plato (1.006), which is astonishing. A regular pale ale will finish out at 3 Plato (twice as sweet), and an all-grain 8.5% stout might finish at 5 Plato--more than three times as sweet, and with a dense body. In British ales, sugar does something like the opposite--it allows very light ales to express their ingredients cleanly and clearly. Since a cask bitter or mild is made with so little malt (these beers are in the 3-4% range), they can't pack much flavor punch. By adding sugar, it lifts them up and exposes them a bit more. Hops are always perceived as stronger in thinner beers--it's why Belgian ales so rarely have much hoppiness--and in cask ales, that means those lovely East Kent Goldings really pop. Sugar can even add its own flavor component. British brewers use a form called "invert sugar," where the sucrose molecule has been cleaved into glucose and fructose—two highly-fermentable forms of the sugar molecule. In Britain, invert sugar comes in a range of colors and can, in beers like stouts and milds, add color along with high fermentability. I interviewed local homebrewer Bill Schneller for my forthcoming book, because he's a big fan of invert. He told me, "You just can’t get the flavors of invert from crystal malts. [Invert gives you] richer color, different dried fruit flavors than crystal alone, plus a drier, easier-drinking beer than if you use all crystal malt. It adds complexity and flavors you just can’t get anywhere else." There are lots of sugars out there, and they'll all work in a beer--sucrose, glucose, fructose, maltose (of course), and so on. Some of them are disaccharides like sucrose and maltose, composed of two monosaccharide molecules (like fructose and glucose). 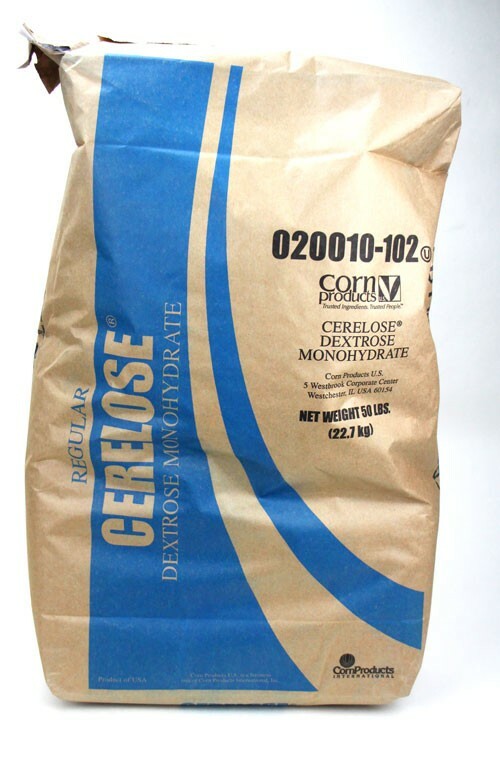 Dextrose is a starch-derived monosaccharide that comes from, ta-da!--corn. It's chemically extremely close to glucose. We have this second bias, probably a good one, against corn sugar. Even the phrase "corn sugar" can be easily turned into an epithet. But the use of corn in beer is not only old and completely respectable (I commend you now to Stan Hieronymus' forthcoming Brewing Local, which will fully and permanently exonerate our only native grain), but it's something even the Belgians do. Indeed, in many breweries you'll find this little side-vessel that you might mistake for use in decoction, but is in fact called a cereal cooker because it mashes corn. No less than Rodenbach does this. You want to tell Rudi Ghequire his beer uses cheap additives? Good luck with that. Dextrose is the most common sugar used in modern IPAs (I think), but I wouldn't bet even a nickel that it's the only sugar. Either way, it's fine. That is about as clear a description of why brewers do this. When you're making an American IPA and you want a bit of caramel malt for sweetness, which can inflect hop flavor, you don't want to add unnecessary body. That's especially true if you're getting up there around 7% or more, when it's impossible to keep the sweetness and body at bay without sugar. The whole thing about American IPAs is that they're a vehicle for all the flavors and aromas of hops. Everything else--water, yeast, and malt--is there just to serve the hops. Sugar is invaluable, just as it is in strong Belgian ales, in this regard. So enjoy your IPA and know that it is in very good beer company. Corn sugar's fine! Don't scorn the corn; praise the maize: a traditional American brewing ingredient.